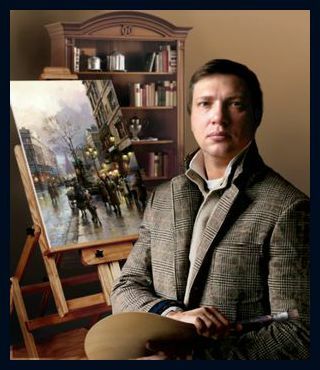 The main inspiration the Moscow artist Maxim Lanchak finds especially in the city landscapes. Sun light and air, mild and warm colors everyone could always finds in the works of the artist, are done by oil or pastel. In his art technique clear lines sometimes are combined with spontaneous expression. His works are full of delicate lyrics and poetry, feeling of movement, flexibility of nature, what was always important for artist. His first graphic works Maxim Lanchak produced as a student of the Moscow Technical University, parallel then working at Moscow Artistic - Industrial Collage. Already then there took place several of his personal exhibitions, amongst others an exhibitions at the Embassy of Canada in Moscow and International ArtExpo New York.Since 1997 Max Lanchak is a member of the Russian Artists Union under the patronage of UNESCO. 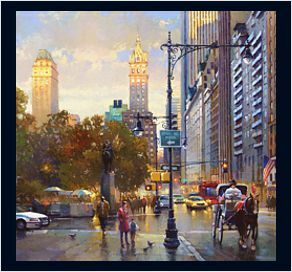 His artistic trips abroad - to the Netherlands, France, Belgium, Czech Republic, USA - inspired him to include the atmosphere of the beautiful architecture and landscapes of European and American cities into his works. After his long trips to New York in 1998-2011 he made many interesting compositions of that city. Presently the works by Maxim Lanchak are in private collections all over the world in the more than 50 countries of the World.